The Ermineskin Junior and Senior High School from Maskwacis hosted a supper and entertained at Parkdale School in Wetaskiwin. The Foods class from Ermineskin High School catered the supper, and then entertainment was provided by First Nation dancers accompanied by the Ermineskin High School drum group. Some of the young dancers attend Parkdale School, and some attend Ermineskin High School. The event closed with everyone invited to join hands in the last dance, variously known as a Round Dance or Circle Dance or Friendship Dance, an opportunity for all people to come together in strength, friendship and togetherness. The event was organized by Miss Deneen Reti, the Maskwacis Wahkotowin (family or kinship) worker at Parkdale, and Mr. Scott Hall, the Foods and Agriculture teacher at Ermineskin High School. The 27 students presently in the Foods class use the skills they are learning to serve 800 hot lunches every school day to the students in the Ermineskin schools. They also do other catering. The skills based program teaches cooking from scratch using local products such as the meats they buy from Pine Haven Hutterite Colony and locally grown vegetables. The menu for this event was simple but delicious: chicken vegetable soup, wiyas (beef) stew, and both regular bannock and cinnamon-sugar coated dessert bannock. Expanding on this emphasis on using locally grown products, Mr. Hall anticipates that the Agricultural Classes will develop production of a self-sustaining food supply. This event was very appropriate for Parkdale School, where a little more than half the student population is from the First Nations. The mix was apparent in the excellent attendance of this event. Also present were some of the members of the Wetaskiwin Regional Public Schools Board, including Chair Deanna Specht and Trustee Robbyn Erickson. This opportunity to come together as a community was effective and enjoyed by all. 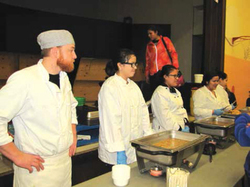 Pictured: Scott Hall on the left, and students Emery Montour, Jeshian Whitebear, Wind Young, and Jenna Montour from his Foods Class catering the supper at Parkdale. Mariah Buffalo and Amelia Wolfe, one of them in the background, also helped. Photo by Margaret Chegwin.